In light of the recent discovery that Taco Bell’s meat for its beef tacos is mostly, um, NOT beef, I thought it was necessary to get a high quality taco recipe out there. One of the things I find so interesting about this news is how surprised everyone is to find out that there are incredibly low quality ingredients being used by a national fast food chain. Hell-oooooooo? People, they are charging $.99 per taco AND making a profit. Do you really think this is a high quality food? Rhetorical question. Answer is no. I have been making my own taco seasoning mix for years and years ever since it occurred to me to actually read the label on the taco seasoning packet I was using. Scary! Is it really necessary to use food coloring and MSG and stabilizers just to season some ground meat? Another rhetorical question. So I copied down the actual spices from the ingredient list and left out the chemicals that could only be made with a centrifuge in a lab, and after a few tries, I had a taco seasoning that was just right, meaning my kids still thought I was using the store-bought packet. Success! 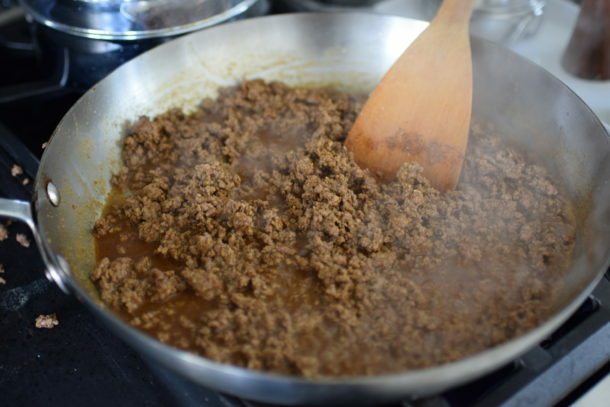 Because we are limiting our beef consumption, I will very often make tacos using ground turkey meat, preferably half dark meat for flavor and half white. 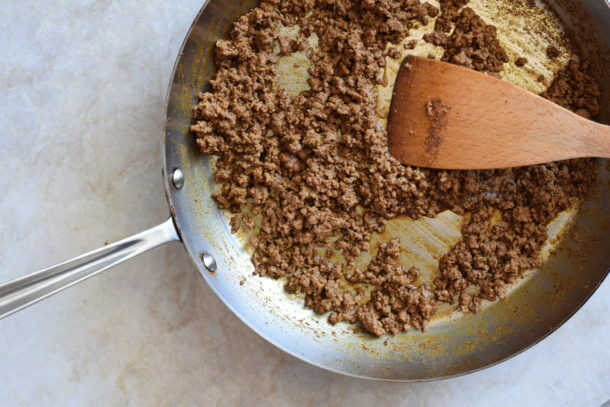 Of course you can use grass-fed ground beef or bison, too. If you are a vegetarian, just finely crumble the same amount of your favorite tempeh and saute it in some olive oil until just browned and use the seasoning mixture in the same way. (Next two photos are of tempeh.) I like tempeh tacos just as much as the ones made from meat! A student reminded me a few days ago that Little League season is right around the corner and would I please add some post-game dinner recipes to the website. Since I have a child in Little League, I know that she is looking for meal that can be prepared as quickly as possible when she walks in the door at 6:15 for starving children, and preferably a warm meal since everyone’s been freezing outside for several hours on metal bleachers. This is a 10- minute dinner if you have all the toppings prepared ahead of time. I like to use soft corn tortillas and set out bowls of guacamole, pico de gallo (fresh tomato salsa) if it’s tomato season, finely shredded lettuce and some shredded raw cheese, if I have it. The topping bar is one of my favorite techniques to make everyone feel as though he or she is getting the meal of his or her choice — and no additional work for me. Serve with a large salad with homemade vinaigrette which you can prepare days in advance and dinner is done! 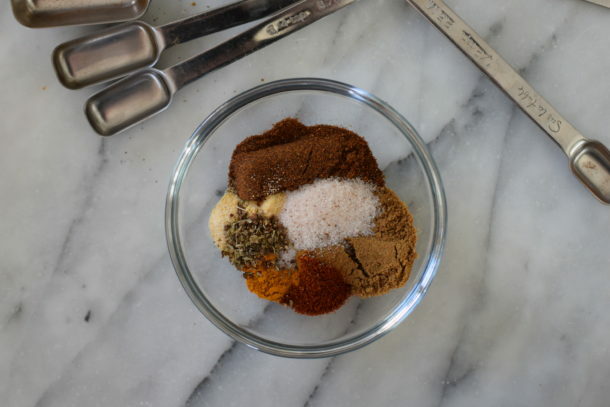 Since I have a feeling this may become a regular dinner item for you, why not triple or quadruple the recipe for the spices and keep the mix in the pantry so that’s one less thing you need to worry about. 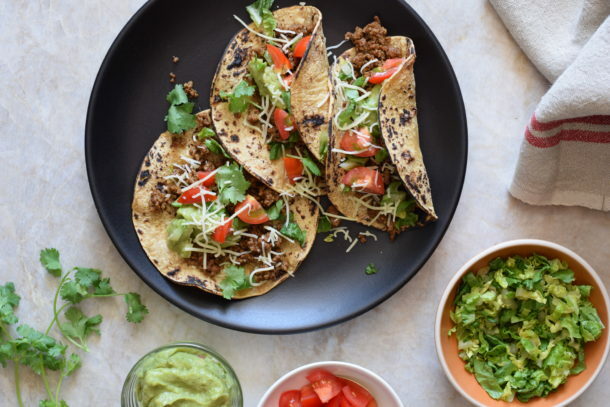 And you thought you couldn’t make tacos without maltodextrin! Hmph. Mix all spices and salt together until well blended. If you're using corn tortillas, you can begin warming them until pliable on a dry griddle or skillet or over a low flame on the stovetop. I like to keep all of them warm in a clean kitchen towel. Heat a large skillet over medium heat. 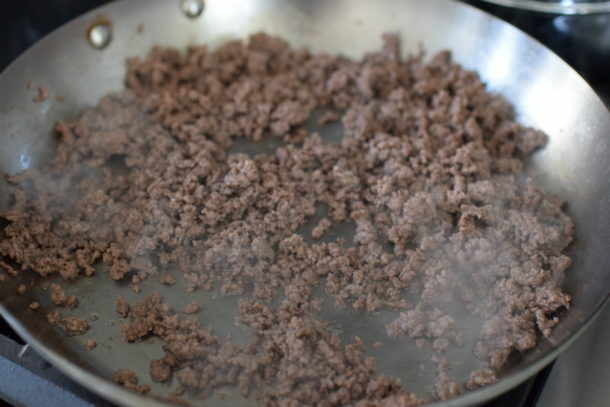 Add the ground turkey to the skillet and cook, breaking up turkey into small pieces (I like to do this by pressing against the meat with a slotted spoon), just until cooked through. If there is any liquid in the pan, drain before proceeding. Dissolve the arrowroot in ¾ cup cold water. Add the spice mixture to the meat and cook over medium heat for a minute. Pour the water and dissolved arrowroot over the turkey and cook until thickened, stirring occasionally. *Not all chili powders are created equally. The one I use is by Simply Organic which has good depth of flavor with a little kick. If you don't care for any heat at all, you can cut back on the chili powder. If you like things spicy, feel free to add a few dashes of cayenne. **The dry spice mixture can be made very far in advance, if desired. The mixture can be multiplied and kept in a glass container for several months. The ratio is approximately scant 3 Tablespoons of spice mixture to 1 pound of meat. I’d like to try these tonight, but I don’t have tumeric or arrowroot powder… can I still make it without those or is there something I can substitute? Thanks for commenting, Amanda. 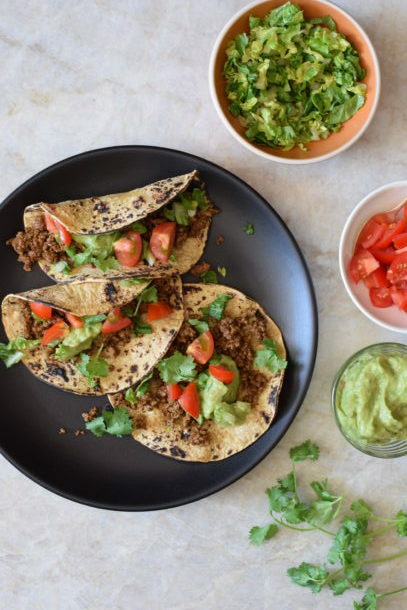 These tacos are my son’s #1 favorite meal! Delicious!!!! I made this tonight and we all love the seasoning, it’s perfect. I used 2 tsp of cornstarch in 3/4 cup water instead of arrowroot and it turned out fine. Good to know! Thanks, Shirin! Haha! Took me a while before I made a big jar of this seasoning mix. Thanks, Kate! Hi Pamela! I am so looking forward to trying these tomorrow night! I was prepping in advance and was silly and didn’t read the directions all the way through and put the arrowroot in with the spice mixture…opps! Do I need to toss it all and start over? Ah. Good question. I would leave the spice mixture with the arrowroot and use it, but I would still whisk some extra arrowroot into the water, perhaps 3/4 teaspoon. Arrowroot doesn’t taste like anything so you don’t have to worry about affecting the flavor of the dish, but if you cook it too long, it loses its thickening ability so that’s why I think you need to add a little extra. Let me know how it turns out! They turned out perfect and delicious! Crisis averted, thanks Pamela! We made the turkey tacos, homemade chips and guacamole. The girls and I absolutely loved every part of the meal, from the preparation to enjoying the end result. Thanks for the great recipes! That’s a fun meal to prepare with kids! I made your tacos for my family tonight. Everyone loved them! I showed my family what ingredients I used to make the taco seasoning…they thought that was so fun! Thank you! Thank you for the success story! We finally made the turkey taco dish on Saturday. It was really good. My family and I loved it! I loved the different seasonings. My kids have declared Saturday nights as Turkey Taco Night! OK….these rock! What an incredible & healthy way to get my required Mexican food during the week. What meat substitute? The tempeh combined with the seasoning has the texture and taste that make the Tacos a regular for me and the family. just printed this one. would be a lot easier if you had a book with all these yummy recipes in it!!! can’t wait to make these. My kids and I love making turkey burgers. I can’t wait to try this recipe!!! This sounds amazing, I can’t wait to try it! !